Preheat the oven to 200°C/400°F. Put the flour and baking powder into a bowl and rub in the cubes of butter, using your fingers until you have a mixture like coarse sand. Stir in the sugar. Refrigerate while you get on with the fruit. Mix the cherries with the lemon zest, juice and sugar and divide among two 1-cup (240ml) capacity ovenproof ramekins. Sprinkle the crumble topping over the fruit, place the ramekins in a baking sheet and bake for 20 minutes or until the topping is golden and the fruit is bubbling. Oooh, this looks fantastic! I loved baked cherry desserts like this! These look delicious! And it's really nice that they're in such small portions! 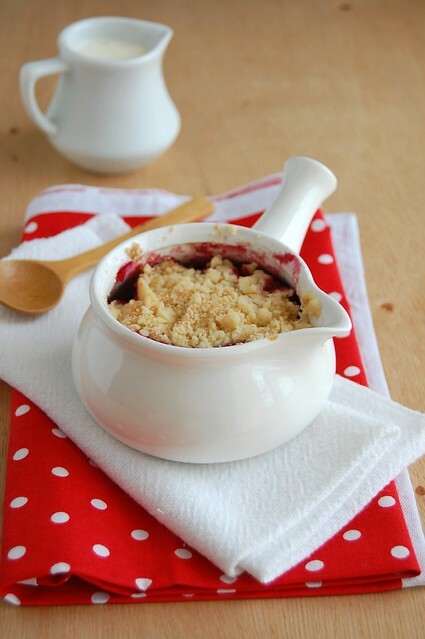 Mmm I love cherries and I love crumbles, a win win! Happy New Year, Patricia! I'm gonna cheat and use frozen cherries. I hope it doesn't mess it up. This looks really good. I'm jealous that your able to bake with fresh fruit! How, adorable, this looks delicious!